Like me, you may have been confused of the term “citation”, that's been mentioned by many. This is when someone mentions or references or links to your business or website. A Citation can be just a mention of your company name, but is more effective if it provides you with full information such like a company name with phone, address, and website. Do they matter a lot to Google? Citations play an imporant role in the way a search engine works, and getting citations can improve a search engines trust in your business name, business locality and website trust. How can they benefit a local business? Getting links or mentions in local chamber of commerce pages, local blogs or local business directories is a great way to build trust with Google in showing your business to be reputable and relevant. There are many potential ways to get citations, some not so easy, but sourcing local trusted business directories is a good starting point. Some of these pointers I have re-worded after looking at tips from other bloggers, but have added to this to explain further each point. Searching for local bloggers and write about how good you find their work, then ask for a mention back. Why not write about a local business that you want people to know about or perhaps you have bought from their shop or used their services and want to give them a good review. Then when the moments right, there's a good oppotunity to ask for a link back to your website or even just a mention of your company. Search on Google for local directories by simply entering your locality and the word directory or business directory. There are many web directories that I could list here, but looking around some other blogs I have seen some links that are valuable and reputable sites and I have also included some other directories. I have captured the below screenshot from a business directory with www.freeindex.co.uk , which is an example of a mention or reference with the full name, address, website etc. 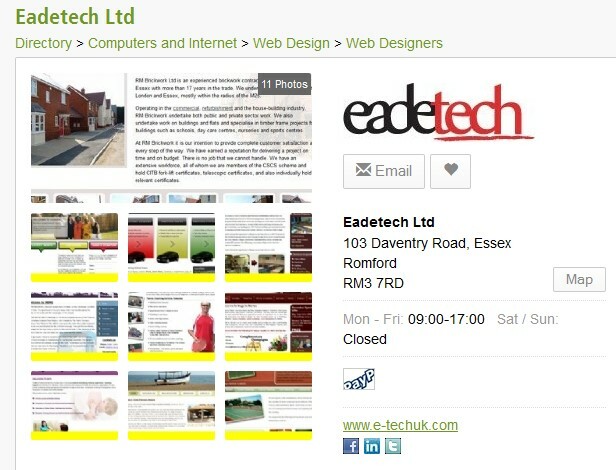 This would be classed as a citation as it contains information about Eadetech and a link to our website. Citations can be a great way to build up local search result relevancy, its easy to sign-up to local business directories, so why not make this a starting point to potentially increase your local visibility.